Explain the difference between declarative and programmatic development. You might think that Salesforce is just a CRM. It stores your customer data, gives you processes to nurture prospective customers, and provides ways to collaborate with people you work with. And it does all those things. But saying that Salesforce is “just a CRM” is like saying a house is just a kitchen. There’s a lot more to it than that. Salesforce comes with a lot of standard functionality, or out-of-the-box products and features that you can use to run your business. Here are some common things businesses want to do with Salesforce and the features we give you that support those activities. Depending on what your company purchases, you can get these features and more without lifting a finger. But you can almost think of these features as a model house that a real estate agent shows off. You could certainly live there, but it wouldn’t be your home. It wouldn’t have your art on the wall or that unusual coat rack your Aunt Tilda gave you as a housewarming gift. That’s where the Salesforce platform comes in. With the platform, you can customize and build whatever it is that makes your company unique. And when you have a business application that’s unique to you, everyone is more successful. Throughout Trailhead, you are introduced to a lot of companies and characters that are using Salesforce in different ways. Let’s meet some of the players. Cloud Kicks—This custom sneaker company is making waves in the footwear industry. They use Salesforce to manage sales and help streamline their complicated order creation and fulfillment process. Ursa Major Solar—On the cutting edge of renewable energy, Ursa Major Solar needs business software that doesn’t shy away from groundbreaking technology. They use Salesforce to manage sales and customer service nationwide. Get Cloudy Consulting—As one of the best cloud consulting firms in the business, Get Cloudy knows CRM. They use Salesforce to manage existing and potential clients, and they’re always looking for new ways to innovate with Salesforce services. 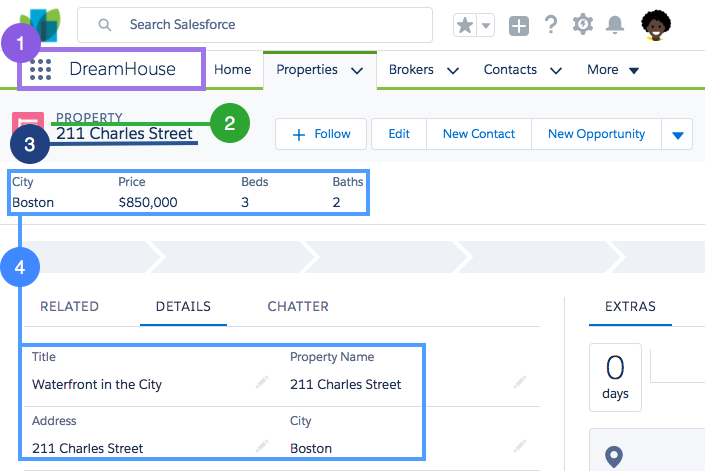 DreamHouse Realty—Known for their fresh approach to real estate, DreamHouse uses Salesforce to connect their employees and improve the efficiency of home sales. We’re digging this house theme, so let’s kick off our first module by looking at DreamHouse Realty. We’ll use DreamHouse’s Salesforce implementation to explain some of the fundamental terms, concepts, and capabilities of the Salesforce platform. Let’s learn a bit more about DreamHouse. Michelle is the lead real estate broker at DreamHouse. She finds many potential home buyers through DreamHouse’s web and mobile apps. With the apps, customers can browse available homes and make a favorites list of properties that they’re interested in. They can also reach out to Michelle or other brokers directly to set up showings. D’Angelo is DreamHouse’s Salesforce administrator. Using the Salesforce platform, he’s building a suite of custom functionality to support Michelle and her team. Michelle can use this custom functionality to edit and view information about the properties she’s selling, as well as keep track of her potential buyers. Remember, Salesforce comes with standard functionality for tracking common sales objects like accounts, contacts, and leads. But DreamHouse is a realty firm, so it has needs specific to its industry and business model. Throughout this module, we work with D’Angelo to see how the Salesforce platform can meet those needs. Perhaps you noticed a strange word in that last paragraph: objects. Object is one of many important terms you’ll learn as you get to know Salesforce. First, it’s important to understand what a database is in the context of Salesforce. When we talk about the database, think of a giant spreadsheet. When you put information into Salesforce, it gets stored in the database so you can access it again later. It’s stored in a very specific way so you’re always accessing the information you need. Let’s take a look at a page from the DreamHouse app to define some of its important elements and how they relate to the database. An app in Salesforce is a set of objects, fields, and other functionality that supports a business process. You can see which app you’re using and switch between apps using the App Launcher ( ). Objects are tables in the Salesforce database that store a particular kind of information. There are standard objects like Accounts and Contacts and custom objects like the Property object you see in the graphic. Records are rows in object database tables. Records are the actual data associated with an object. Here, the 211 Charles Street property is a record. Fields are columns in object database tables. Both standard and custom objects have fields. On our Property object, we have fields like Address and Price. Another important term that’s hard to capture in a picture is org. Org is short for organization, and it refers to a specific instance of Salesforce. The image here is taken from DreamHouse’s org. Your company can have one or multiple orgs. That’s a lot of new stuff to tackle. If you don’t get it all right away, don’t worry. As you continue to learn about Salesforce, the terminology will start to come naturally. 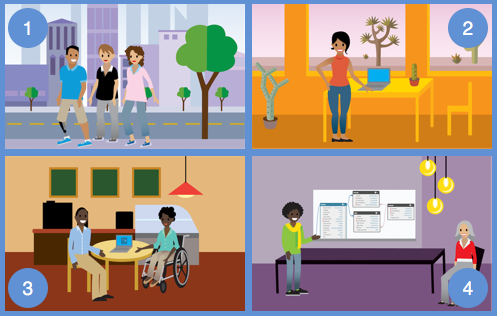 A Trailhead Playground (TP) org is a safe environment where you can practice the skills you’re learning before you take them to your real work. TPs come with all the standard app building and customization tools required to test your app development chops. If you’ve ever heard of a Developer Edition (DE) org, a TP is a special type of DE. When you sign up for Trailhead, we automatically create a TP for you. So if you haven’t signed up yet, now is a great time to do so. If you’re already signed in, scroll to the bottom of this page and click Launch to open your TP. TP orgs are free and you can have up to 10 of them at a time. To create one, go to any hands-on challenge, click the down arrow next to Launch and select Create a Trailhead Playground.. If you hit your max or want to manage your TPs, you can view and delete them from your Trailhead profile. If you ever need your TP’s username and password, you can access them using the instructions here. Go ahead and launch your TP so we can start getting our hands dirty. You already know that you can use the Salesforce platform to develop custom objects and functionality specific to your business. What you might not know is that you can do most of this development without ever writing a line of code. Developing without code is known as declarative development. With declarative development, you use forms and drag-and-drop tools to perform powerful customization tasks. The platform also offers programmatic development, which uses things like Lightning components, Apex code, and Visualforce pages. But if you’re not a programmer, you can still build some amazing things on the platform. Let’s start small. Michelle wants a way to quickly indicate whether a potential home buyer is prequalified for a home loan. To make this change, D’Angelo wants to create a prequalified checkbox on the contact object. 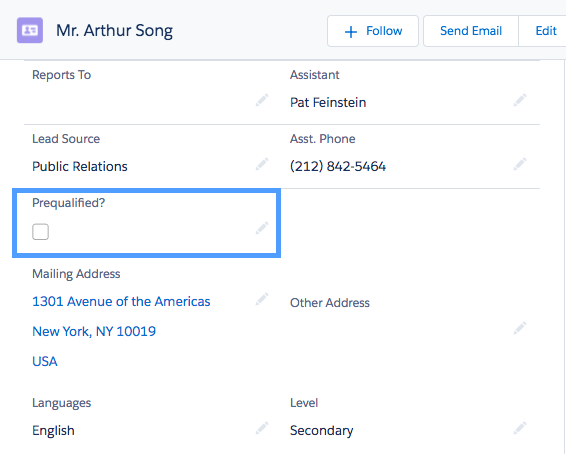 In Salesforce-speak, we’re adding a custom field to a standard object. Let’s see how he does it. From the gear icon ( ), click Setup to launch the setup page. We use Setup a lot, so remember this step! Under Fields & Relationships, click New. A data type indicates what kind of information your field holds. For this field, pick Checkbox and click Next. The Field Label is what you see on the Contact page. Enter Prequalified? and click Next. You just customized your first object. Great job! Let’s take a look at what we did. Open the App Launcher and click Contacts. Use the arrow to view All Contacts and click a contact name. Under the Details tab, you can see your new field. Now it’s easier for Michelle and the other brokers to log and retrieve this important piece of client information. We added that field pretty quickly. But it turns out that we did more than just add a field. At the same time, the platform did a lot of work under the hood. Obviously the new field was added to the user interface. You can also run reports and create dashboards that reference your new field. The field is even ready to go in the Salesforce mobile app. And you didn’t have to do anything except click Next! That’s the power of the Salesforce platform. In the next unit, we talk about some of the ways you can harness the platform for your business. If you were following along in the unit, you've successfully completed a "Prequalified?" checkbox. Now, test out what you learned by making a completely new field. This time around, you'll make a currency field rather than a checkbox. Complete the new challenge below to try out what you learned.